You Are Here: Home > What’s new about the 2019 C 300? 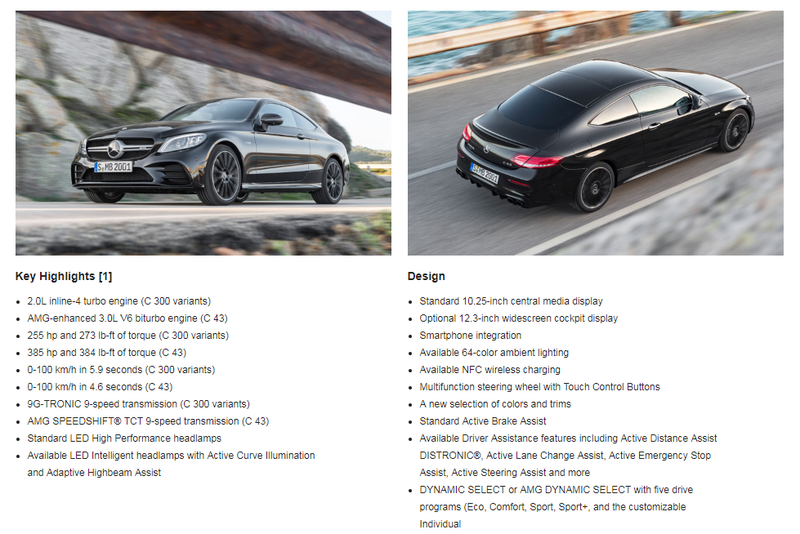 What’s new about the 2019 C 300? Revised bumpers and steering wheel, more horse power, a 10.3” widescreen display, all-digital instrument clusters, standard Apple CarPlay and Android Auto, and all intelligent drive features previously found only on the S- and E-Class. At the rear, dynamic styling, a two-pipe exhaust system and LED headlamps complete this athletic stance. Within, a digital cockpit welcomes you to an environment where ingenious technology and refined materials combine for unmistakable luxury. The Intelligent Drive technologies now included in the C-Class put it on a par with S-Class vehicles. Features like Active Distance Assist DISTRONIC®, Active Steering Assist with Active Lane Change Assist, and Route-Based Speed Adaptation provide the coupe with an intuitive awareness of the road around it, heightening an already brilliant driving experience. That experience can be enjoyed in either the standard C 300 or its 4MATIC® all-wheel drive variant. You´ll feel the upgraded power in its new 2.0L inline-4 turbo engine, producing 255 hp and 273 lb-ft of torque*. Paired to a 9G-TRONIC 9-speed automatic transmission, the result is performance that more than complements the riveting design and technology. Shop 2019 C 300’s at Mercedes-Benz of Union HERE!